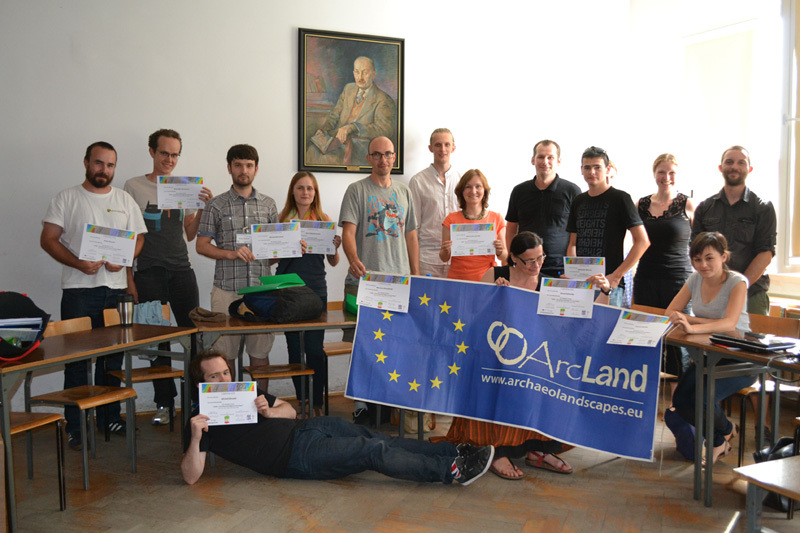 Following the great interest in last year school 15 archaeology students and young professional archaeologists from Poland, UK and Canada, working on past landscape projects attended the second training school on LiDAR – Innovative Technology for Archaeology 2 (LITA2) in Poznań (Poland). The main aim of LITA2 was to understand practical methods for data capture, processing algorithms and formal analysis of the results, as well as how LiDAR data can be used to develop appropriate archaeological inferences. The course considered LiDAR/ALS data and was taught using a combination of lectures and practical sessions. More info: http://archeo.amu.edu.pl/lita_2. You can download a flyer here. Registration is now open for the Lidar visualisation and interpretation workshop 2014 in Esslingen, Germany. The workshop will be a four-day event (including one field day) for students, graduate students and young professionals who are looking for theoretical background as well as hands-on experience with visualisation techniques for high-resolution digital elevation models (mainly but not exclusively based on airborne lidar) in the field of archaeology. The aims of the workshop are to bring together students and young professionals to learn about lidar visualisation techniques and archaeological interpretation. The programme will include presenta-tions, visualisation and mapping exercises and a field day. The maximum number of participants will be 20; please register early. Participation fee will be 50 €. 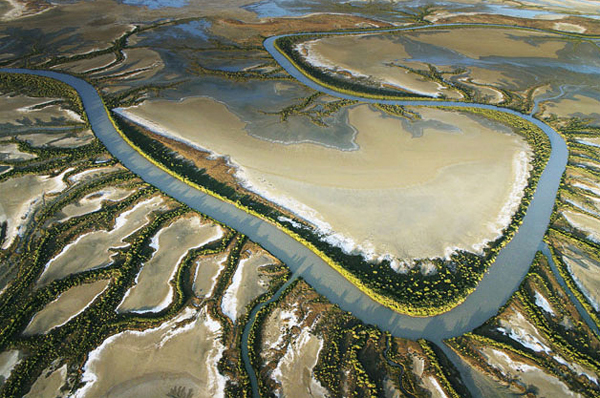 A limited number of ArchaeoLandscapes travel grants will be available. You can download grant application rules, application forms and expenses form here. The workshop will take at the State Office for Cultural Heritage Baden-Württemberg (Landesamt für Denkmalpflege) in Esslingen, Germany. Esslingen is located 15 minutes by train from the city of Stuttgart and 30 minutes by bus from Stuttgart airport. The State Office for Cultural Heritage is located a short walk from the train station and bus terminal as well as from Esslingen’s historic city centre. The aims of the workshop are to bring together students and young professionals to learn about lidar visualisation techniques and archaeological interpretation. The programme will include presentations, visualisation and mapping exercises and a field day. The maximum number of participants will be 20; please register early. Participation fee will be 50 â‚¬. 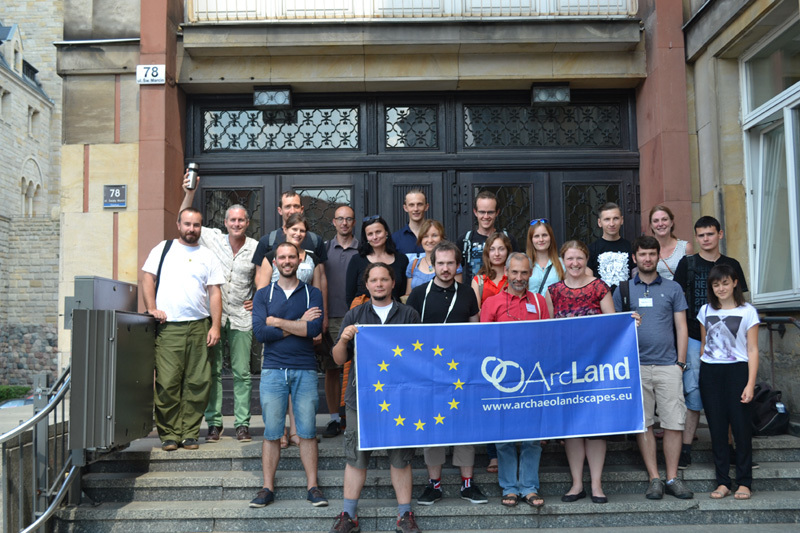 A limited number of ArcLand travel grants will be available. For further information about these grants please confer to the grant information page. Further information about the registration for this workshop will be available here soon. The workshop will take at the State Office for Cultural Heritage Baden-WÃ¼rttemberg (Landesamt fÃ¼r Denkmalpflege) in Esslingen, Germany. Esslingen is located 15 minutes by train from the city of Stuttgart and 30 minutes by bus from Stuttgart airport. The State Office for Cultural Heritage is located a short walk from the train station and bus terminal as well as from Esslingen's historic city centre. The ArcLand partner Instituto de Ciencias del Patrimonio (Incipit) organizes, in cooperation with the Instituto de Arqueología de Mérida (IAM), a new edition (9th) of the Specialization Course on "Geospatial Technologies for Archaeology". The course is organized in two modules, introductory and advanced, that will take place respectively in Mérida and Santiago de Compostela (Spain) between 21-30 April 2014 (introductory) and 5-14 May 2014 (advanced). The course is aimed at graduates in archaeology interested in the use of GIS, remote sensing, photogrammetry,… for archaeological research and management. Inscription is opened until March 31st. Please note that the full course is given in Spanish! BARS_2 - A Second Archaeological Remote Sensing Project at Balla Secondary School, Co Mayo, Ireland. The first project in Balla Secondary School (BSS), BARS_1, was developed and delivered in 2012/2013 and much experience gained in the process. Following the success of BARS_1, it was decided to extend the project into the 2013/2014 academic year and hence BARS_2 was born. This will use Kite Aerial Photography (KAP) and geophysics to investigate features associated with an 11 ha Early Christian monastic enclosure. The project will involve the 2013/14 Transition Year class. This site is located at Mayo Abbey in the catchment area of Balla Secondary School and about 5km to the south of the school. Part of this site had previously been researched some years ago for an MSc in Applied Geophysics. BARS_2 will involve pre-third level education Transition Year (TY) Students in the age range 15 to 16 years. This remote sensing module, from the perspective of the teaching activity at BSS, provides input to the overall objectives of the TY programme. In addition it provides an opportunity to integrate elements of a number of subjects in the syllabus; in particular, history, geography, physics, ICT (information and Communications Technology) and art. BARS_2 will have an additional element in relation to agricultural science where soils in the survey area will be investigated. From an ArcLand perspective BARS_2 will introduce the application of remote sensing to a younger audience who may find it offers ideas on future careers and education. Previous work (Madden, 1999) has shown the monastic enclosure to be prospective using remote sensing techniques. The earlier work used a range of topographic and geophysical techniques on a local grid in an enclosed field to the southeast of what appears to be the main enclosure. 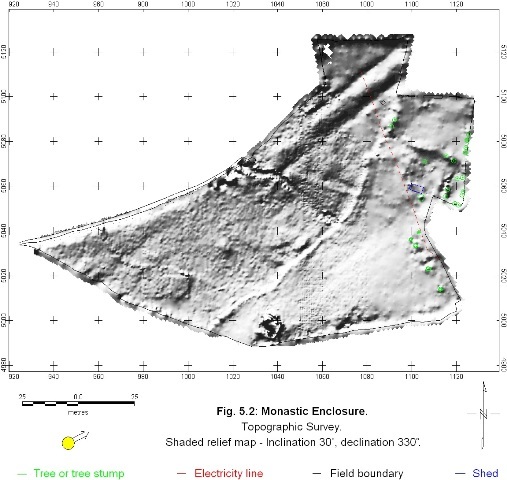 A detailed topographic survey using a total station indicated there is a number of internal divisions and possible enclosures in this survey area. A reconnaissance magnetic susceptibility survey was carried out to investigate settlement, agricultural or industrial activity in the vicinity of the monastic enclosure. The survey indicated distinct zonation and internal features contained within a boundary mirroring that of the main enclosure. 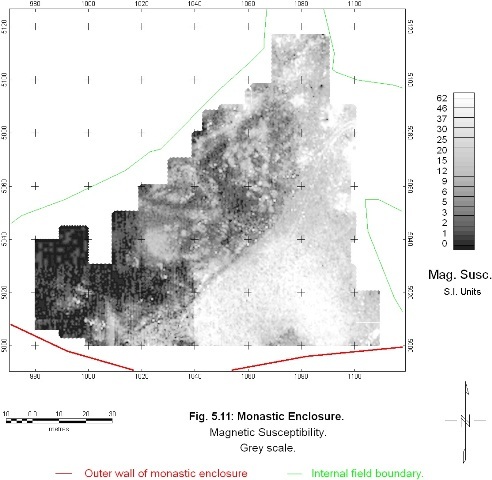 The magnetic gradiometry, surveyed at a higher sampling density than the magnetic susceptibility, revealed a complex pattern of enclosures and boundaries with evidence for cultivation in the southeast of the survey area. BARS_2 is being delivered over 8 weeksÂ starting in January 2014. The remote sensing survey will further extend and define features discovered in the earlier survey and investigate the flora and cultivation in the southeast of the survey area. 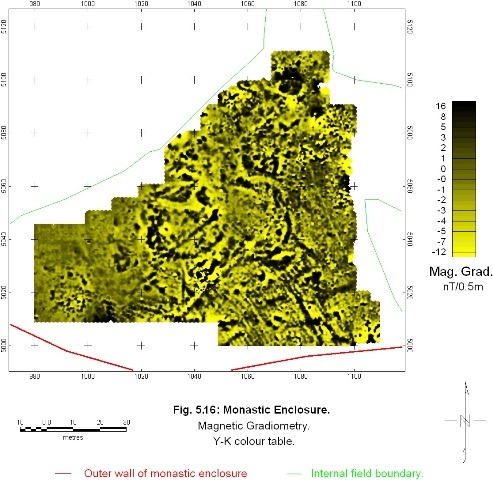 The field survey – kite aerial photography, metal detecting, magnetic susceptibility, magnetic gradiometry, earth resistance and electrical resistivity tomography combined with soil analysis and vegetation survey. Presentation of the results in the school and to the local community at the ArcLand Archaeology Above and Below Workshop in April 2014. Kevin Barton, Landscape & Geophysical Services, Claremorris, Co Mayo. Miriam Cooney, Transition Year Co-ordinator, Balla Secondary School, Balla, Co Mayo.